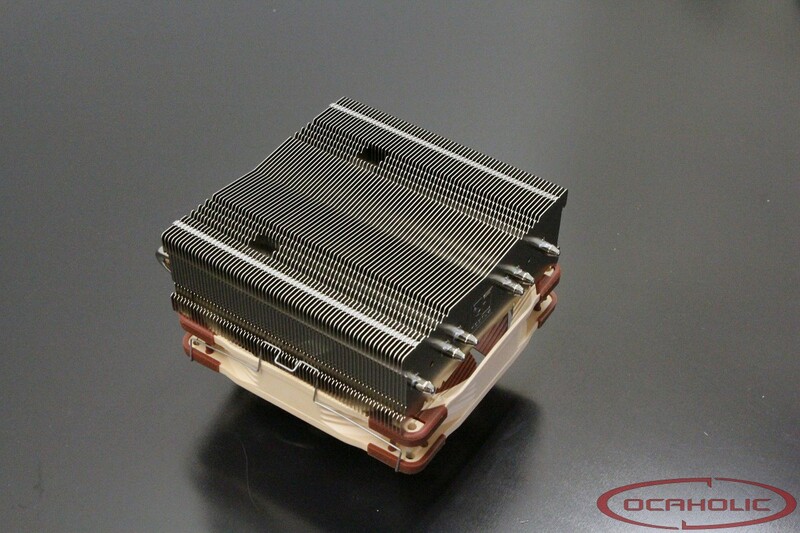 Today we are having a look at Noctua's latest tower CPU cooler, the Noctua NH-C14S. This particular model is based on a down-draf design, while the cooler is attached to the underside of the heatsink. Other than that there is a nickel-plated copper base through which six 6mm cooper-heatpipes are routed. Fresh air comes is being pulled through the fins by one 140 x 150 x 25 millimeter PWM fan. If you wish to it's possible to equip this cooler with a second fan to further improve performance. Both the base and the heatpipes on the Noctua NH-C14S are made from nickel-plated copper. It features six heatpipes which are not in direct contact with the CPU but have been routed through a copper base. The Noctua NH-C14S is based on a down-draft design, which allows for direct cooling of the motherboard area underneath. The delivery includes one large PWM measuring 140 x 140 x 25 millimeter and max RPM is 1500. It's possible to equip this cooler with two fans sandwiching the fin stack. The fin stack itself is made out of aluminum and as you can see, it is clear that this is quite a big CPU cooler with dimensions of 165x150x161mm. The manufacturing quality is definitely on a high level and we honestly did not expect anything less from Noctua. The box is made out of solid cardboard and although it is only protected by a plastic shroud our sample arrived without a single dent or any damage whatsoever. One of the bundled fans have been attached in between the towers while the second one is in a very nice looking small box. The rest of the mounting components are placed in three separate small boxes. The bundle includes all installation manuals for different sockets signed by Noctua's CEO, AMD mounting kit and the Intel mounting kit, four fan clips (two already mounted), a 3.5g tube of thermal compound enough for 15 applications, one fan and of course the tower heatsink itself.